After U.S. Senate candidate Roy Moore didn't deny dating teens but denied sexual misconduct charges, a large segment of Alabama evangelicals said they're more likely to support him. Thirty-seven percent of self-identified evangelicals in Alabama now say they are "more likely" to support Moore in light of the allegations, whereas 28 percent say they are "less likely" to vote for him; to the remaining 34 percent, the allegations made "no difference," a JMC Analytics poll, conducted between Nov. 9 and 11, found. A Nov. 9 Opinion Savvy telephone survey found that over 82 percent of Alabama voters were aware of the allegations and that 54 percent of all voters, and almost 73 percent of Republicans, said that Moore should not withdraw from the race. When given the option to write in Luther Strange, whom Moore defeated in the primary earlier this year, Democrat Doug Jones leads Moore by a 43.6 percent to 41.3 percent. On Thursday the Washington Post broke the story reporting that when Moore was in his 30s he engaged in sexually inappropriate relationships with several teenage girls, including one who was 14. Moore and his campaign have denied the more serious charges of sexual misconduct with a 14-year-old, but didn't deny "dating" older teens. In a Friday radio interview, when asked whether he dated teen girls when he was in his 30s, he answered "Not generally, no. If I did, I'm not going to dispute these things, but I don't remember anything like that." Then later answered it was "out of my customary behavior" and not "without the permission of the mother." Moore resolved to press on while prominent Senate Republicans have called for him to step aside and leave the race. The special election will be held on Dec. 12 to fill the seat once held by Jeff Sessions, who is now the Attorney General. The polls, however, which previously showed Moore with a solid lead, now show a neck and neck competition. As of Sunday afternoon, Moore is leading by a slim 1.7 points, according to Real Clear Politics aggregate of polling data, though that includes only four polls and only one since the story broke. Senate Republicans have distanced themselves from Moore, with even noted conservatives like Utah's Mike Lee withdrawing his support. Others who know Moore are going on record to lend credence to The Washington Post account. 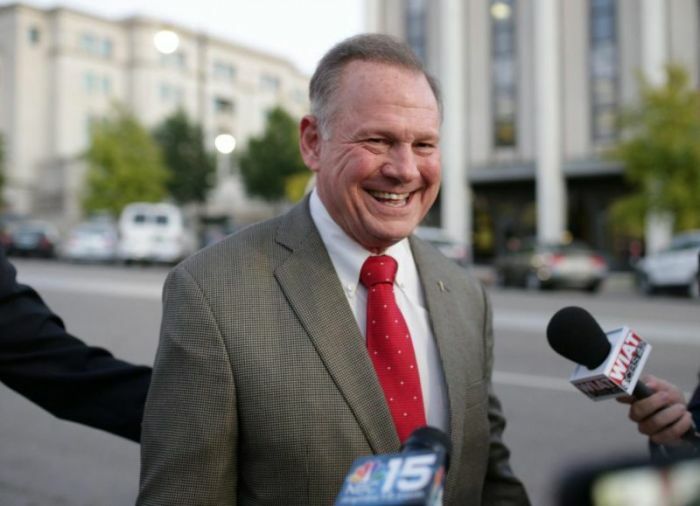 According to CNN National Correspondent Alexander Marquardt, deputy district attorney Theresa Jones, who worked alongside Moore several decades ago, told CNN: "It was common knowledge that Roy dated high school girls, everyone we knew thought it was weird ... We wondered why someone his age would hang out at high school football games and the mall." Moore, however, has resolved to stay in the race, saying Saturday he believes that Alabamians will "see through this charade," The Washington Post reported. But in Moore's hometown of Gadsden people are skeptical. "Why this exposure now?" asked Roderick Thomas, a Baptist pastor, according to AL.com Friday. He said he had no problem with the story but was suspicious of its timing, particularly since Moore's alleged illicit behavior happened nearly 40 years ago. "Why not before, during the 10 Commandments story, or the gay rights fight? Why not do it then? I don't care if its a Democrat or Republican thing," he said. Jamelle Simmons, also of Gadsden, told AL.com that she usually votes Democrat, but she too was suspicious of the timing of the story. "Timing is everything," she said. "I don't know if he's guilty. If he is, that needs to be dealt with. Right is right, and wrong is wrong. I don't care who you are." The Washington Post's Nov. 9 piece detailing the allegations was "a desperate attempt to stop my campaign" the Senate candidate said in his first appearance since the story broke. Moore told an audience of 100 supporters at a Veterans Day breakfast in Vestavia Hills that it was "not a coincidence" that the article was published four and a half weeks before the election. He vowed that Democrats, establishment Republicans and anyone else involved in the story would not stop his campaign. State law forbids the removal of Moore's name this close to the election but the state party can petition to disqualify his candidacy. Should that happen or if Moore does withdraw, any votes for him would not count.